The new logo for the St. Mary's County Department of Emergency Services. 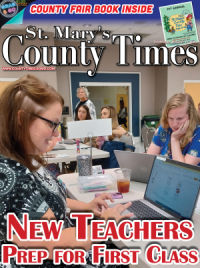 Last fall, the St. Mary's County Department of Emergency Services was separated from the Department of Information Technology. Since then, the department has worked to establish its own unique identity among employees and county citizens. "We believe the new logo is symbolic of how the Department of Emergency Services is circled around our major discipline partners we work with," said Steve Walker, Emergency Services Director. "This will further bring home the point of how we, working together, help to protect and serve the citizens and visitors in the county." Inside the logo features a red line for Fire, a green line for EMS, yellow line for 911 Dispatch and blue line for Law Enforcement. The logo, approved by the Commissioners of St. Mary's County at their June 12 meeting, is not intended to replace the county seal. The logo will work in concert with the seal. The department will begin to incorporate its new logo effective July 1. 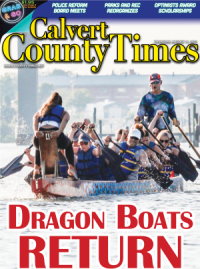 The St. Mary's County Recreation and Parks Board meeting, originally scheduled for Thursday, July 5, has been canceled. Recreation and Parks Board meetings are generally held on the first Thursday of each month, unless otherwise noted. The next regularly scheduled meeting of the Board is Thursday, August 2, at 5:30 p.m., in the commissioners meeting room inside the Chesapeake Building in Leonardtown. For more information, please contact the St. Mary's County Department of Recreation and Parks at 301-475-4200, ext. 1811. A construction contract for Section 3 of the Patuxent Park Revitalization Project has been awarded to Great Mills Trading Post, Inc. A notice allowing work to begin has been issued for Monday, July 2. Construction is scheduled to follow soon thereafter. The project will take approximately nine (9) months to complete. Improvements will be performed on Saratoga Drive, part of Midway Drive (between Saratoga Drive and Bunker Hill Drive), part of North Essex Drive (near Saratoga Drive intersection), Wasp Drive and Card Road. Work will involve the reconstruction of roads, sidewalks, driveway aprons and storm drainage system (including storm water management devices). While construction is underway, residents may experience temporary inconveniences such as parking restrictions, roadway lane closures, construction noise and construction vehicles in the area. Temporary "No Parking" signs will be placed at least two (2) days in advance of work at each street location. At that time, residents are asked to relocate their vehicles parked along the roadway. Fences within the county right-of-way, located within the limits of grading, may need to be removed and re-installed to allow for a smooth transition into existing grade. Every effort will be made to minimize disturbance during construction. County citizens often have questions about how county government operates. They want to know which county department is responsible for a particular service, who are the decision makers and how are decisions arrived at. Citizens interested in learning how county government works can sign up for the popular St. Mary's County Government Citizens Academy. Now in its fifth year, Academy sessions will be held on seven Tuesday evenings, between September 4 and October 23, from 6 to 9 p.m. Sessions will take place at various county operated locations. The Academy's mission is to provide an overview of county programs and services. Participants will gain a better understanding of county government operations and receive a certificate upon successful completion. St. Mary's County citizens, 18 years of age and older, are eligible to participate. Enrollment is limited to 25 pre-registered applicants. "The Citizens Academy provides an excellent chance to learn about county government from the inside," says Commissioner President Randy Guy. "Participants can speak with department heads and staff, ask questions and get answers regarding county government operations." The opening session features an overview of county administration. Subsequent sessions will be hosted by the departments of Aging and Human Services, Economic Development, Land Use and Growth Management, Recreation and Parks, Public Works and Transportation and Emergency Services. "Citizens Academy participants become more engaged with county government by becoming advocates in their communities," says County Administrator Dr. Rebecca Bridgett. "Our goal with the Academy's is to educate and inform about the programs and services county government provides to citizens." June 21 marked a milestone for the St. Mary's County Senior Rides Program as it celebrated 10 years of operation. Senior Rides, a program within the Department of Aging & Human Services, provides older adults with door-to-door transportation to medical appointments, social engagements, shopping, and more. Adults 60 years of age or older, who are unable to utilize other public transportation options and lack reliable sources of transportation, are eligible to utilize the service. An application is required for all interested in participating in the program. Applications can be completed by phone, in-person or via mail. Over the past 10 years, nearly 300 individuals have been served by Senior Rides. Volunteer drivers have made 4,000 trips, traveled approximately 263,000 miles and have put in over 13,000 hours. The first Senior Rides volunteer was documented on January 1, 2008. The first Senior Rides trip was made on March 14, 2008. "It's absolutely needed," said Senior Rides Program Coordinator Julie Burch. Burch has been working with Senior Rides since December 2015. Prior to that, she provided transportation to her grandparents, taking them to medical and social appointments when needed. She is pleased to now coordinate similar services for others in the community. "The Department of Aging & Human Services is proud to offer another transportation option for our county's older adults," said Lori Jennings-Harris, Department of Aging & Human Services Director. "Senior Rides Program volunteers are very dedicated to helping others. We are most appreciative of our Senior Rides Volunteers." Drivers benefits include mileage reimbursements, supplemental accident insurance, Driver Safety Training and volunteer recognition. Once accepted into the program, riders are asked to make their requests for transportation at least three business days in advance for locations within the county and five business days for destinations out of county. Out of county rides are exclusively for medical reasons. Due to the limitations of the program, transportation requests are limited to 4 per month per rider. Transportation requests are not a guarantee of service and can only be accommodated if a driver is available. Those interested in learning more about the Senior Rides Program can visit www.stmarysmd.com/aging/transportation.asp or contact Julie Burch by email at Julie.Burch@stmarysmd.com or call 301-475-4200, ext. *1066. 1) As required by Chapter 113 of the St. Mary's County Code, incorporate the approved Capital Improvement Budget of the St. Mary's County Metropolitan Commission for FY2018-2023 into Tables 3-4 and 4-5 of the CWSP. 2) Update Table 3-2 Inventory of Existing Community (Water) System Appropriations. 3) Insert text regarding arsenic levels into Chapter 3. Note that as a result of the evidence and comments made at the public hearing, changes may be made to the proposed amendments. Copies of the proposed amendments are available for viewing at the St. Mary's County Department of Land Use and Growth Management, 23150 Leonard Hall Drive, Leonardtown, Maryland, and at www.stmarysmd.com. The Garvey Senior Activity Center's Readers Theater group received an honorable mention from the Maryland Association of Senior Centers for their work in the Expressive & Creative Arts category on June 14. "We're delighted," said Readers Theatre volunteer facilitator Linda Lagle. Lagle was first approached by Garvey Senior Activity Center Operations Manager Brandy Tulley two years ago with the idea of starting a theatre group. "We wanted to develop a theater group that offers a low pressure opportunity for our senior members to get involved with theater. Ms. Lagle had the idea to try Reader's Theater and it has worked well," Tulley said. The group rehearses twice a month and performs at the Garvey Senior Activity Center a few times during the year. They have even performed in the community at local senior living facilities and nursing homes. "I am proud of the work they do and that they were recognized by the Maryland Association of Senior Centers," Tulley said. "We can't wait to see what they have in store for future productions." Senior Center Operations Division Manager Alice Allen was pleased to hear about the recognition the Readers Theatre group has received and looks forward to seeing the group at the Garvey Senior Activity Center continue to grow. "I love the concept of Readers Theatre," she said. "It's a wonderful opportunity for theatre-type activities without the readers' stress of memorizing parts. And the skits are usually hilarious." "It's such a talented and fun group of actors," Lagle said. "Everyone has a good time giving their all for each performance." The Reader's Theatre group rehearses twice each month with lunchtime performances every quarter. The next performance will be held in the fall on a date to be determined. The group is always looking for new talent and no experience is necessary to join, Lagle said. For more information, or to get involved, call 301-475-4200, ext. *1073 or email Brandy.Tully@stmarysmd.com.